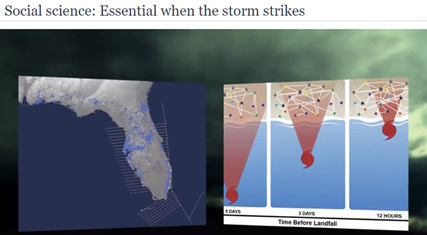 A new National Science Foundation video — "Social science: Essential when the storm strikes" features research on hurricane risk communication and decision making by NCAR MMM Scientists Rebecca Morss, Julie Demuth, Heather Lazrus, and colleagues. This research is part of the Communicating Hazard Information in the Modern Environment (CHIME) project (funded by the National Science Foundation) and the NCAR MMM Weather Risks and Decisions in Society (WRaDS) program. Communicating Hazard Information in the Modern Environment project. Morss, R. E., and Co-authors: Hazardous weather prediction and communication in the modern information environment. Bulletin of the American Meteorological Society, in press.